Low-Carb Turkey Cutlets with Dijon Sauce is a super-quick and easy recipe and if you have picky kids, just give them a piece without the sauce! And this tasty recipe is low-carb and dairy-free, and if you use a little more mayo to thicken and skip the flour like I did, it can be Keto, gluten-free, and South Beach Diet Phase One. Use the Recipes-by-Diet-Type Index to find more recipes like this one. 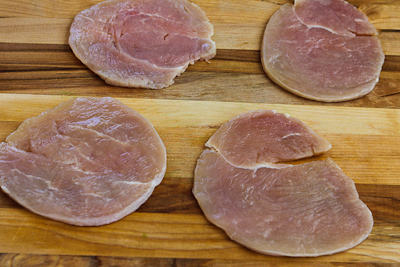 Click here to PIN these Tasty Turkey Cutlets with Dijon Sauce! I’ve been getting so much satisfaction from the process of updating my very earliest recipes with new photos. Not only does it give me a chance to cook some of my favorite recipes again, but I know that the new photos might entice someone to try a recipe that they probably wouldn’t have been inspired to cook otherwise. 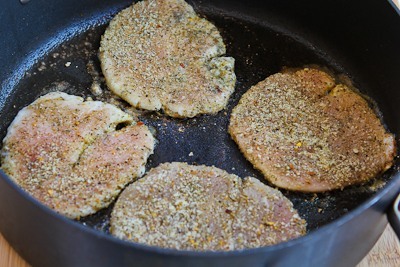 If you scroll down to the end of the step-by-step photos on this post, you’ll see why I was especially happy to get new photos for this delicious recipe of quickly-sauteed turkey cutlets with Dijon sauce. That first photo was from September 2005, when I’d barely entered the digital camera age with a little point-and-shoot camera, and in those days I had plenty of passion for cooking, but very little skill in photographing the food! When I first posted this recipe, I dredged the turkey cutlets in a very small amount of flour, but this time I decided to use almond flour to make a recipe that would work better for people who might like to eat this for Phase One. The almond flour (not almond meal, which is coarser) worked well to coat the turkey pieces before cooking, but I did use one tablespoon of flour in the sauce to thicken it a bit. If you want to make this even better for Phase one, or make it gluten-free, just omit the flour and you’ll have a slightly thinner sauce which will still taste just as good. 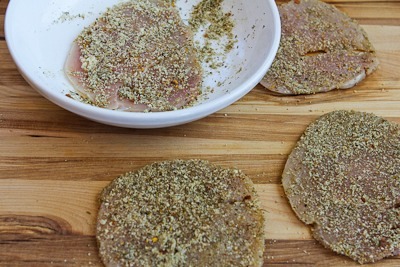 This recipe starts with turkey breast cutlets, but if you can’t find them, just use thinly sliced turkey breast pieces. 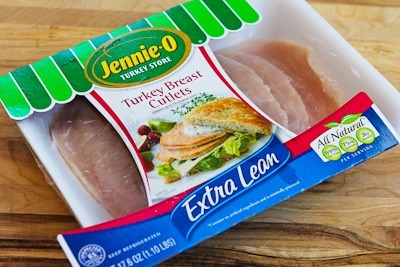 Since turkey breast is so lean, and these pieces are so thin, it’s important to cook them very quickly or they’ll dry out. 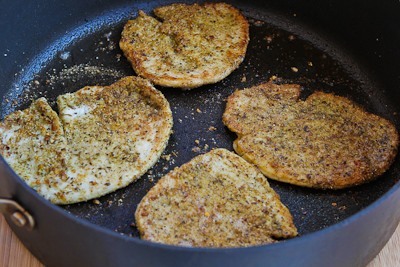 Mix the almond flour, poultry seasoning, chicken rub, salt or Vege-sal, and pepper in a dish that will easily hold the cutlets. (If you don’t have the exact seasonings I used, you can substitute any seasoning mix that would taste good on poultry.) Then dip each turkey piece in and rub the almond flour mixture on both sides. I used a mixture of butter and olive oil for best flavor (and I wouldn’t worry too much about such a small amount of butter per serving) but you can certainly use all olive oil. Heat the oil over medium heat, then add the turkey cutlets. Watch carefully and turn them when they are barely starting to look done on the edges, about 2 minutes. Then cook them an additional 1-2 minutes on the other side, until they feel firm (but no hard) when you press on the meat with your finger. Be careful not to overcook! Remove the meat to a place and cover with foil to keep it warm. (I rarely bother doing this but for this recipe I would because the pieces are so thin they’ll cool down quickly. Add the chicken stock to the pan and cook about 2 minutes, scraping off the crumbly parts that stick to the pan with a whisk or turner. Then add the mayo/Dijon/flour mixture (or just mayo and Dijon if you’re making this for a Phase One or gluten-free version. Lower the heat and whisk like mad to get the sauce ingredients all combined. 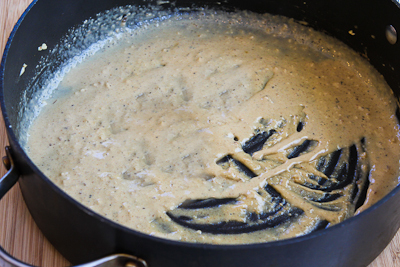 (If you’re not that experienced making pan sauces, using a whisk is crucial.) Cook just until the mixture is thickened, a couple of minutes more (or slightly longer without the flour.) Serve sauce over turkey pieces. Combine almond flour, poultry seasoning, chicken rub, Vege-sal, and pepper in flat dish. Dredge all turkey pieces in almond flour mixture and set aside. Heat nonstick frying pan big enough to hold all the pieces in one layer, add olive oil and melt butter over medium heat. Add turkey cutlets and watch until they barely start to look done on the edges, about 2 minutes, then turn and cook for 1-2 minutes longer on the other side. The turkey is done when it feels firm (but not hard) to the touch. 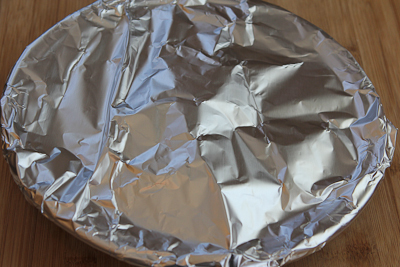 Remove turkey to a plate and cover with foil to keep warm. 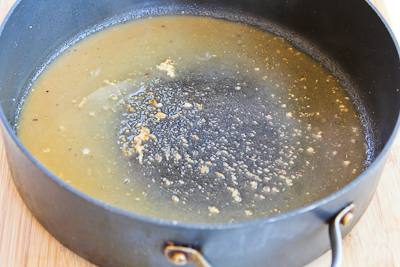 Deglaze the pan with chicken stock, stirring well to get browned bits from the bottom of the pan. Whisk together Dijon and mayo, and 1 teaspoon flour if using, then whisk into the sauce. Cook sauce, whisking the whole time, until it is reduced by about 1/3, about 2-3 minutes (or slightly longer if you’re skipping the flour.) Pour sauce over turkey and serve immediately. If you make the version of this that omits the flour, it would be suitable for most any low-carb diet plan, and also for Phase One of the South Beach Diet. (Even if you used a little flour to thicken the sauce, the amount of carbs will be really minimal.) Obviously omit the flour if you need it to be gluten-free. I chose the South Beach Diet to manage my weight partly so I wouldn’t have to count calories, carbs, points, or fat grams, but if you want nutritional information for a recipe, I recommend entering the recipe into Calorie Count, which will calculate it for you. Or if you’re a member of Yummly, you can use the Yum button on my site to save the recipe and see the nutritional information there. Deborah and Meg, it's fun to see the progress isn't it? Your new/old photo project is great (and amusing to see the difference). I agree with Lydia that many of us have shudder-worthy early shots… but I guess you have to start somewhere. I have been going back and cooking and re-photographing at least one recipe a week. It sure is crazy what a difference a good photo makes!! Regardless, though, I think this sounds wonderful – and I think my kids would love it! In the U.S. I think more people buy ground turkey than anything else except during the holidays, but I love these turkey cutlets for a light dish. Fun comparing to our earlier photos isn't it! Turkey is not that popular here. It is sold around December for Christmas feasts. I have never seen turkey cutlets here. I make a similar dish using chicken fillets. My early photos were very ordinary too. Amazing how far we have all come. Lydia, this one was really wearing on me, and I had it on my list to update for ages before I got to it! I'm giggling, because for many of us, the photos we took in the early days of blogging are ones that make us shudder now. You're so right, though, that this recipe is one that deserves an update. I love the sound of this mustard sauce. I showed this to my class because we are making a class blog, and the kids think it looks good.